I’m doing some work with low income kids, helping them to apply to college, so I bought a new version of this book. I turned to my child’s college first: Cornell University. It shows 27,039 applicants for an admit rate of 22%. Are you serious? That is so far off that it is shocking. Then I started thumbing though the book, trying to figure out just which incoming class is used as the basis for this book. It is the “2019 Edition” so presumably this is the incoming (starting in fall) class of 2018, graduating 2022, but I could not find this stated ANYWHERE. There does not yet seem to be a 2018 Common Data Set posted for Cornell but a press release boasts 51,324 applications this year ……so, Princeton Review, where are you hiding the other 24k kids who applied? The admit rate was 10% this year, not 22%. Even if there is a lag and you are using Fall 2017 Common Data Set, that was 47k applications, 12% admit rate. Is the entire book this sloppy? You guys sell these books like hotcakes. Even if this were an error on Cornell's end, you can afford a proofreader! I'd say the veracity of this publication is questionable. I would guess--and I haven't tried to make a study of the matter--that this volume is one of, if not, the premiere book of its kind (and there are certainly others doing the same thing) available to help college-bound people sort out and get an impression of a range of good colleges and universities. It's kind of like a candy sampler. Readers get a quick taste of the options and from that they can eliminate some schools and begin to focus on others. The book is nicely done. It has a helpful, consistent format for introducing or examining the basics and the high points of the 384 schools that are included. 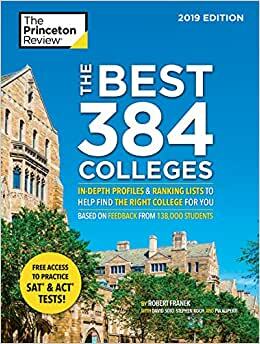 This book tells a little about the character of the college and what people say about it which makes it more helpful than the other Princeton Review book although the other has more colleges. I am helping my grand daughter in her school hunt. I find college web pages singularly unhelpful . Of the books, this is one of the best. I would also recommend the book "Colleges that Change Lives." This guide was recommended by a college adviser and contains a wealth of valuable information. The guide has been around for many years and they must have a reason for organizing it alphabetically. However, I think most people focus on one region at a time, especially when trying to plan campus visits, which is difficult to do with this book. Unless you are just starting your search and you are giving equal consideration to Boston College and Berea (KY) College, be prepared to spend time flipping pages.